Siliguri: The rise of Binay Tamang and his lobby in the Gorkha Janmukti Morcha has posed a problem for leaders and supporters of the BJP in the foothills. The reason: Tamang has not formally acknowledged the BJP as his ally. In fact, he and some other leaders have raised serious charges against the BJP for "duping" the hill population and "using their votes" to win elections. "Binay Tamang and his associates are running the show now while Bimal Gurung is still into hiding. 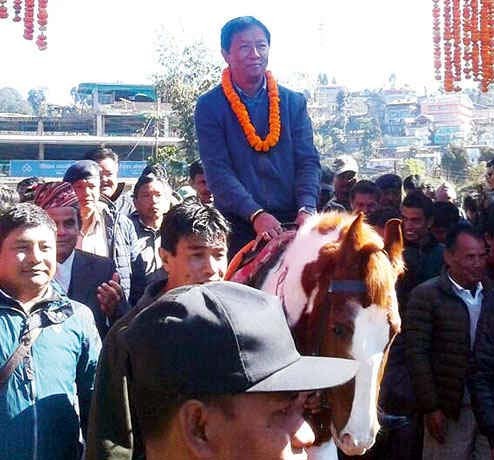 Gurung has time and again asserted that his party is still an ally of the BJP but these days, there is no leader from his camp to reiterate it in public. On the other hand, Tamang is gaining support. This has left a major section of our local leaders and supporters, particularly those residing in the Terai and Dooars, confused," said a BJP leader from Jalpaiguri. Since 2009, the BJP has always maintained its alliance with the Morcha and could manage to bag the Darjeeling Parliament seat twice with the hill party's support. This support also helped the party win the Birpara-Madarihat Assembly seat on last year. But recently, there had been a major political change, particularly in the Dooars. Most of the Morcha leaders there have defected to Trinamul. Also, it is not very clear as to whether in the Terai, the Morcha would focus again to consolidate its support base or would lay low. "We do not have any inkling as to whether we should consider the Morcha as our ally. There are still some supporters of the party in the Terai and the Dooars most of whom are with Binay Tamang. But considering the manner in which our party delegation was heckled in Darjeeling by youths who are known to be close to the Tamang camp, we have serious doubts," said a BJP leader in Birpara. Some state leaders of the BJP, including state president Dilip Ghosh, have time and again criticised Tamang but so far, none of the central leaders have commented on the "future" of BJP-Morcha alliance. Recently, the party held a public meeting in Siliguri and also arranged meetings in other districts where the key attraction was Mukul Roy. It also managed to get a few local -level Trinamul leaders on board. But, party leaders working in smaller towns and villages pointed, such meetings can effectively help the party only if it clears its stand on Morcha. "Unlike Cooch Behar, where our party has managed to build a good base to take on Trinamul, situation is different in Darjeeling, Jalpaiguri and Alipurduar districts. In these districts, we enjoyed the Morcha's support since 2009 and did not strive to build bases," said a leader in Malbazar. The rise of Binay Tamang and his lobby in the Gorkha Janmukti Morcha has posed a problem for leaders and supporters of the BJP in the foothills.